Chiang Mai is a city in mountainous northern Thailand. Founded in 1296, it was capital of the independent Lanna Kingdom until 1558. Its Old City area still retains ruins of walls and moats from its history as a cultural and religious center. It's also home to hundreds of elaborate Buddhist temples, including 14th-century Wat Phra Singh and 15th-century Wat Chedi Luang, adorned with carved serpents. Thailand's northern capital is an escape from the whirlwind pace of life of its southern rival. Despite the constant arrival of planes and trains full of sightseers, the city is still blissfully calm and laid-back. This is a place to relax after the chaos of Bangkok and recharge your batteries with fabulous food and leisurely wandering. If you don't want to participate in the vast array of activities on offer, just stroll around the backstreets, and discover a city that is still firmly Thai in its aspect, atmosphere, and attitude. 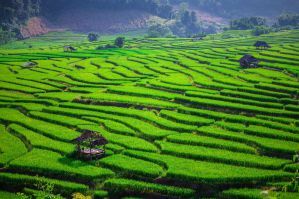 A sprawling modern city has grown up around ancient Chiang Mai, ringed by a tangle of superhighways, but if you drive in a straight line in any direction, you'll soon find yourself in the lush green countryside of northern Thailand. A short ride by motorcycle or chartered rot daang ('red truck') will deliver you to pristine rainforest reserves, churning waterfalls, serene forest wat, bubbling hot springs and peaceful country villages - as well as a host of adventure camps, elephant sanctuaries and souvenir markets. With so much to see and do, Chiang Mai is a great place to experience, and there are several options for exciting activities and tours in or near the city. Begin your 5-hour tour with convenient pickup at your Chiang Mai accommodation at 7am or 1pm, depending on your selected departure time. Be sure to bring a change of clothes, as well as a hat, sunglasses, and sunscreen. 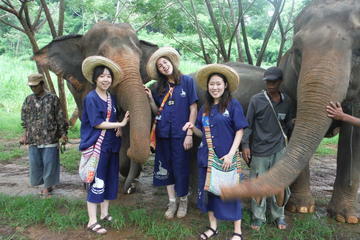 Once you arrive at the park, get changed into clothes you don't mind getting dirty and meet the elephants. You'll get the opportunity to feed them some treats, including bananas and sugar cane, while learning about the Baanchang Elephant Park's mission: providing elephants with the highest possible quality of life. You'll also have the opportunity to walk with the elephants through the hills that make up the park. Change back into your clean clothes and enjoy some coffee, tea, and fresh fruits before departing. You'll be dropped back at your hotel in Chiang Mai at the end of your tour. 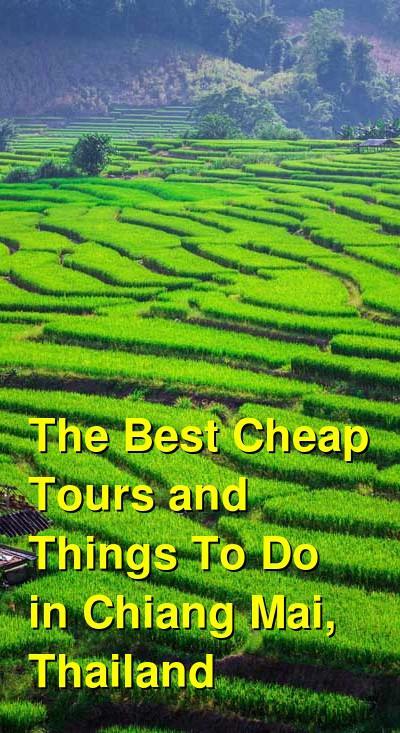 This tour lets you experience the real Chiang Mai in a variety of ways. You can see Temples and monks, experience a cruise on the Mae Ping River, enjoy local noodles and explore a market place. This Chiang Mai city tour adventure will begin by exploring the Warorot Market, one of the largest markets in Chiang Mai. Almost everything is for sale here from food to clothing to hill tribe crafts. At the market, you'll have plenty of time to taste and sample local specialties before moving on to the Ton Lam Yai Flower Market, overflowing with colorful, fresh cut flowers. Next, you'll take a songthaew to Wat Chai Mongkol, a magnificent temple that was built on the banks of the Mae Ping River. Take part in a local Buddhist practice by offering alms to monks and learning about other interesting religious traditions. Then it's time to take a cruise up the Mae Ping River, one of the main rivers in northern Thailand and the lifeline of Chiang Mai. The Mae Ping River cruise will reveal villages and rural life played out on the river shores, and your guide will offer insight into local livelihood and history throughout the journey. Next on your Chiang Mai tour you'll enjoy a sumptuous Khao Soi lunch at a local farmer's house. This noodle dish is often made with chicken or beef, served over Chinese egg noodles, and garnished with shallots, cilantro, pickled mustard greens, fried whole chilies, and a squeeze of lime juice. After lunch, you'll visit a garden to learn about local vegetables, herbs, and the medicinal properties of plants, before returning back to Chiang Mai by cruise. This is where your Chiang Mai city tour will come to an end, and you're free to continue exploring Chiang Mai at your leisure. Choose from an early morning, midday or afternoon departure from Chiang Mai with hotel pickup included. Board the deluxe air-conditioned minivan for a scenic one-hour drive to the Flight of The Gibbon site, situated deep in the Thai rainforest. Group size is limited to nine people to ensure customized attention from your guides. Start with a detailed safety briefing and orientation, followed by time to get outfitted in your harness and other provided gear. When the group is ready, your guides lead you to the beginning of a series of 30 platform stations. Eighteen ziplines run between the platforms, and other aerial stops include three hanging sky bridges, two staircases and a treehouse. 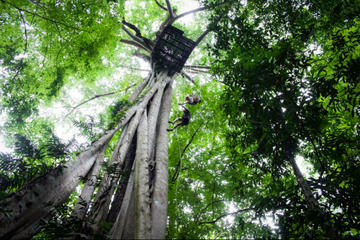 Soar through the treetops by zipline and enjoy the fun of two rappel descents. Your 5-hour eco-adventure is supervised by experienced guides who share informative details about the rainforest flora and fauna along the way. In addition, you can enjoy three nature walks, including a hike up the seven-tiered Mae Kampong Falls for more scenic views. If you're lucky, you may even spot wild gibbons, although they can be elusive. This adrenaline-inducing canopy course covers 3 miles (5 km), including one 2,624-foot (800-meter) cable - the longest zipline in Asia. Built and designed with fun and safety in mind, the course is suitable for children (ages 6 and up) and adults alike. Enjoy a Thai lunch and bottled water before your experience ends with return transport to Chiang Mai and drop-off at your hotel. This gentle half-day cycling tour takes you on a memorable and informative tour of this ancient city's most interesting sights and beyond the city walls where you'll visit stunning temples and local markets. Some of these sights are well off the tourist track so you'll get to visit the city's best attractions, and experience a different side of Chiang Mai from most visitors on this easy 12.4mi (20km) ride. You'll have a leisurely start along the banks of the Ping River where you will ride through quiet country lanes and be introduced to Thai culture as you pass local villages, markets, plantations, and ancient ruins. 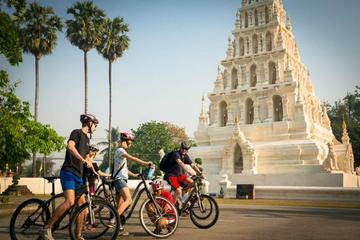 Suited for all riders, this family-friendly cycling tour is ideal for those who would like to explore and experience Chiang Mai the non-traditional way.